I just know the Corsair Glaive would survive the apocalypse. Every inch of this excellently constructed mouse smacks of high quality – similar to the vibe you get from Microsoft’s Xbox Elite controller. Those Omron switches can stand up to 50 million clicks, don’t you know? This mouse is seriously praiseworthy, but how does it stack up against the Logitech G900 Chaos Spectrum in our guide to the best gaming mice? 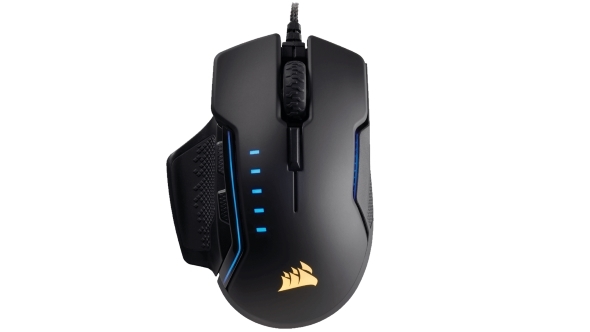 That’s a good start for Corsair’s second priciest mouse (after the button-mad Scimitar Pro), but with so many competitors in the same price range vying for supremacy, is sturdiness the only thing the Glaive can boast over its rivals? Click on the quick links below if you want to get straight to the juicy bits. Well, the rubberised contour of the aluminium body and strategically-placed rugged grip pads ensure you don’t need to make undue effort to move it. 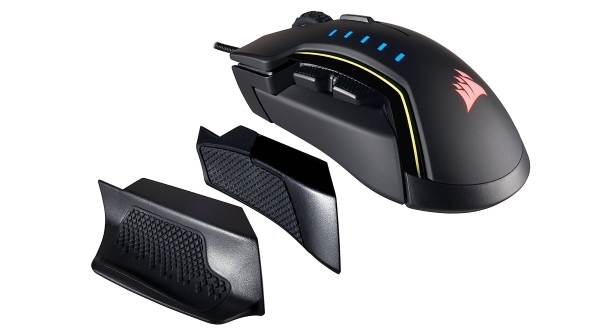 The 122g weight strikes a perfect balance, too, making the mouse feel like it’s stuck to your hand. The $70/ £70Glaive only has six programmable buttons, but for most game genres six will be plenty. It’s especially difficult to be angry with Corsair about this when each one is so pleasant to use. The forward and back switches on the thumb side have an especially cathartic haptic feedback to them. Corsair include three interchangeable thumb rests that snap on magnetically, in both grippy and smooth varieties. The different shapes mean that those with podgy and spindly fingers alike are going to be able to game comfortably – especially you palm grippers out there. 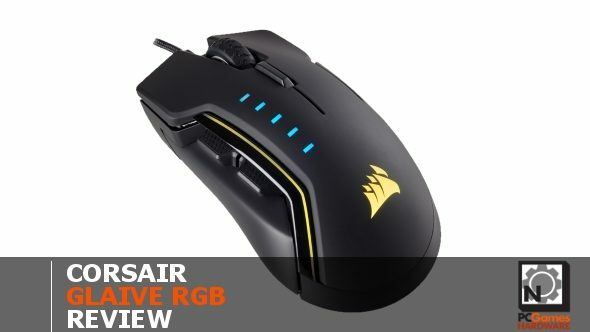 Corsair’s Utility Engine (CUE) is magnificent – the depth in which you can edit the mouse to suit your needs is remarkable. The software has an interface so user-friendly your dog could use it. 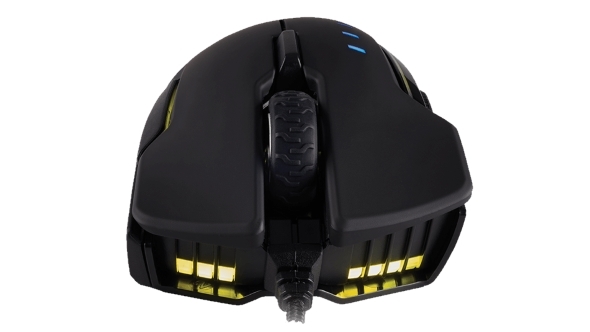 It’ll record your macros based on every conceivable motion or button press, let you edit the mouse lighting down to the RGB value, and adjust the DPI levels you cycle through in increments of one up to 16,000. You can enable or disable angle snapping and adjust pointer precision, before finally calibrating it to the surface you’re playing on. You can save all this in the mouse’s onboard profiles, meaning you can plug into another PC and carry on macro-ing like nothing changed. While it’s certainly capable of being used by claw-grippers, the Glaive lends itself to palm-grippers in particular. The soft curve sits perfectly in the hand with your fingers naturally resting near the end of the left and right mouse buttons. The left mouse button, DPI button and scroll wheel are all easily accessible by your index finger from here, while the two thumb-side buttons sit low enough that you can press them with barely a movement. The Glaive’s 122g weight walks the tightrope between light and heavy, giving it a reassuring heft that you can still throw about the desk with ease when the fight gets particularly hairy. If adjusting DPI on the fly is your thing you should particularly enjoy the DPI display’s location. It sits to the left side of the mouse so when you lift your index to place it on the DPI button the display becomes visible. It’s little things like this that can make the difference required to best your enemy – nobody wants to be faffing with unintuitive peripherals in-game. The adjustable DPI, perfect weighting, and smooth gliding of the Glaive mean you can run-and-gun with the utmost confidence. Corsair worked with Pixart to create the PMW 3367 sensor and it’s pinpoint accurate. It doesn’t have the super-high polling rate of the 2,000Hz Cougar Revenger S, but if 1,000Hz is good enough for esports professionals, it’s good enough for us. Buying a cheap-but-cheerful gaming peripheral can come back to bite you later down the line. Investing instead in a more expensive piece of kit that’ll serve you well for a long time, however, will leave you with a big smile on your face, and oh boy does this mouse make you smile. No, it doesn’t have buttons galore like some others, but everything it can do it excels at. For some, the cable will be a deal-breaker, but then there are likely more for whom wireless gaming mice are a no-no. It’s also sporting a resolutely right-handed design, so it goes without saying that this won’t be one for the lefties. It’s currently retailing at $70 (£70), which is about the going rate for a good-quality gaming rodent. Is it worth the asking price? Every single last bit of it. The build quality is exceptional, and it’s incredibly easy and enjoyable to use, with the reworked Pixart sensor being speedy and accurate. This means the Corsair Glaive is jostling around with the best gaming mice out today. It’ll be interesting to see how Logitech’s updated G903 fares against it. But, if you’re able to, you owe it to yourself to give this little gaming beauty a try.